Click to see more ..
Project managers can submit new project requests based on business case. Portfolio managers have a central place to see all new project requests and looking at project benefits, cost, budget, resource, etc information, s/he can approve new project requests. Portfolio managers have an easy way to check project alignment with overall portfolio goals and objectives. Essentially, portfolio manager can centralise intake of project demand, optimise project portfolio for resource capacity and overall strategic alignment. Portfolio managers gets a bird eye view of financial status of portfolio of projects looking at the dashboard. Executive management can quickly refer dashboard to make an informed decisions, instead of calling project managers for a review meetings. 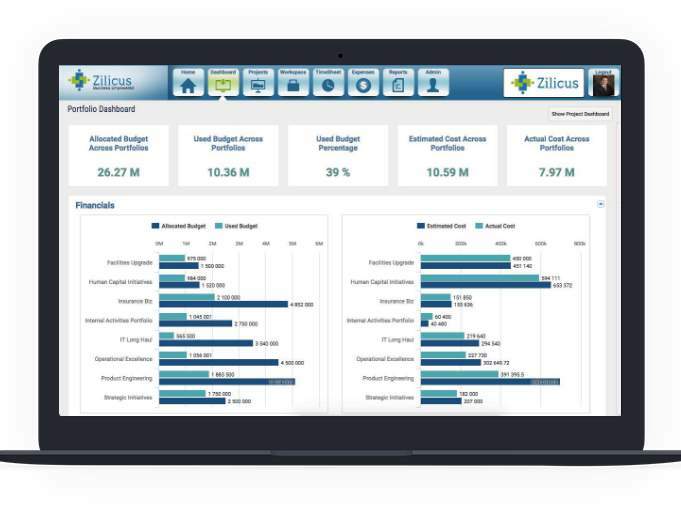 Once you start using ZilicusPM, you will happily forget about Excel, MS Project, status meetings and all such operationally inefficiencies techniques to streamline your project portfolio planning, tracking & financials management. As a portfolio manager you can easily optimise your resource capacity and improve utilisation. 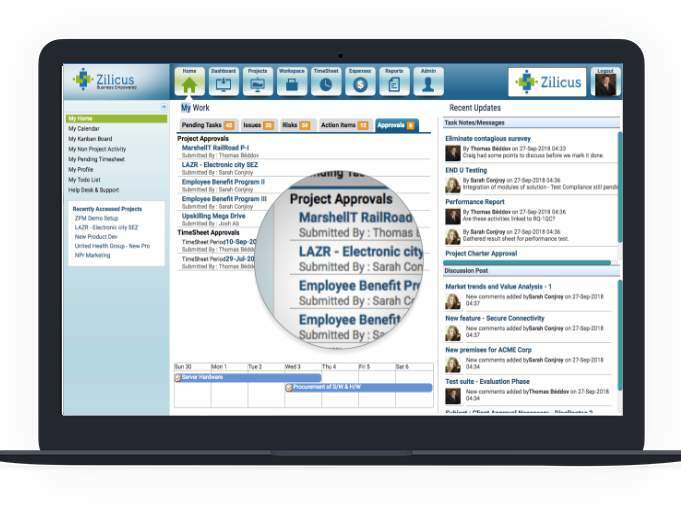 ZilicusPM online project portfolio management tool (PPM software) delivers a combined view to balance demand and capacity of staff members by roles, and named resources. Portfolio managers have a clear view of staff members with certain skills, roles and can see the demand of workload for planned projects. Comparing the demand with current availability of resources gives a better understanding of whether new staffing/ hiring is required or need sales team to get more work. Project portfolio manager can check issues, risks and changes reported across portfolio of projects using portfolio dashboard. Tracking issues, risks and changes per portfolio based on status, impact is as easy as clicking the portfolio dashboard and hovering mouse over the charts. This is great way for portfolio managers to keep track of things happening in its portfolio without calling up project managers or asking for reports. All these information is available for him/her online, 24x7, anywhere in the world. There are elements such as earned value management, schedule performance index, cost performance index, project success ratio, etc. ZilicusPM gives you easy ways to track performance of portfolio of projects using its portfolio dashboard and reports. There are multiple ways to get a clear sense of how portfolio of projects are progressing. One of the important aspects is milestones. Portfolio managers can quickly track how many milestones in a given portfolio of achieved or pending. S/he can as well check specific milestones in given portfolio of projects at a click of mouse. Portfolio Gantt chart view, on the other hand gives a single line view of portfolio timeline, it is combined timeline of individual projects in it. Portfolio managers can easily track progress made at a portfolio level as well as individual projects. If required, s/he can click to see detailed schedule of all projects. Portfolio management means strategic initiatives for many businesses. Project portfolio managers can define goals and objective per portfolio using ZilicusPM project portfolio management software. It is expected that projects in a given portfolio will align to specified portfolio objectives and help organization to achieve portfolio goals. Executive management along with portfolio managers need to look at high level progress indicators for all related projects. The project portfolio management system ZilicusPM let you clearly see schedule progress at individual project level as well as portfolio level at an aggregate basis. Just as the way individual project manager would like to see value earned for a project, ZilicusPM provides a useful indicator for project portfolio managers to check value earned for a given portfolio. 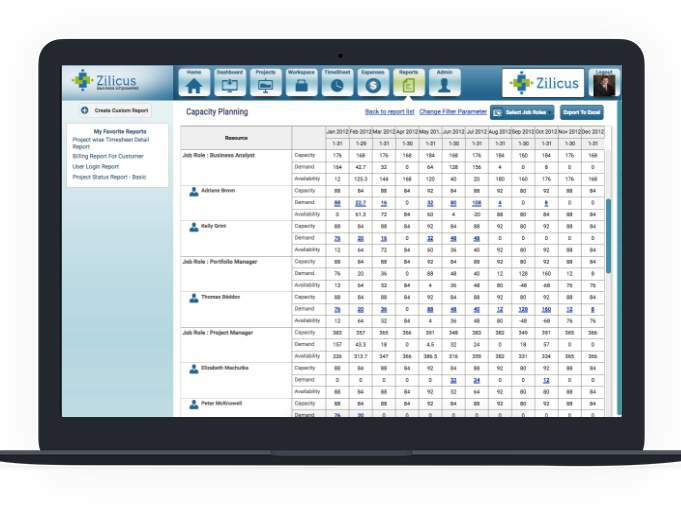 Zilicus PPM software clearly shows schedule performance index as well as cost performance indext at project level as well as portfolio level. Portfolio managers and especially executive management would like to see high level status of projects undertaken by their organization. 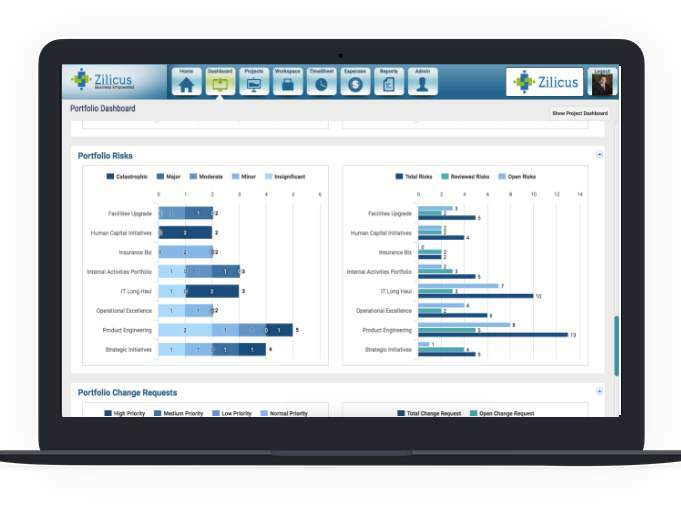 ZilicusPM - project portfolio management system provides a high level status of portfolio using portfolio dashboard - that is easy to skim, clear to understand the reality of projects. The clear advantage organizations have with comprehensive project management tool ZilicusPM is, every aspect of project can be tracked using single central platform. And portfolio dashboard in ZilicusPM, exactly shows you key health indicators (schedule, resources, cost, issues, risks, progress) at one place. It is not surprising that project managers love Gantt Chart. With many other project management tools, if portfolio managers wants to check schedule progress, they have to check Gantt chart per project. ZilicusPM makes it super easy for portfolio managers to track multi-project Gantt chart at one place - Portfolio Gantt chart. Portfolio manager can decide which projects, which portfolios to be viewed in Gantt chart and in few clicks they can track multi-project Gantt chart in ZilicusPM. 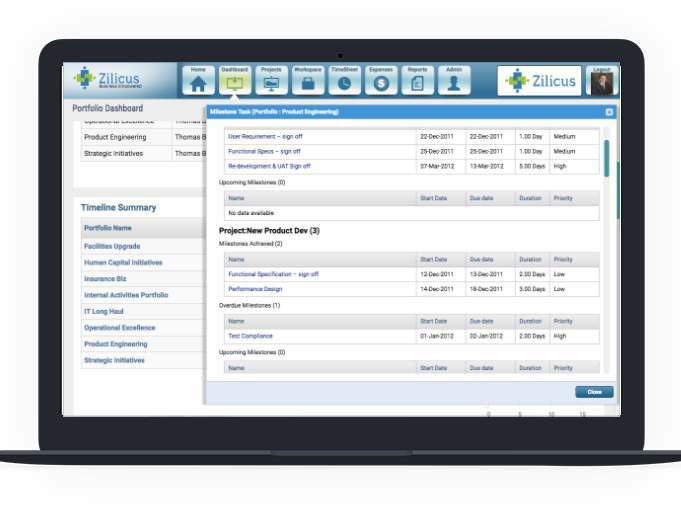 ZilicusPM project portfolio management software enables portfolio manager to easily track status of project-portfolio in terms of schedule, resources, cost, time, etc. There are portfolio reports available for portfolio managers to view status of portfolio value earned, schedule progress, resources utilized, cost, billing, etc.